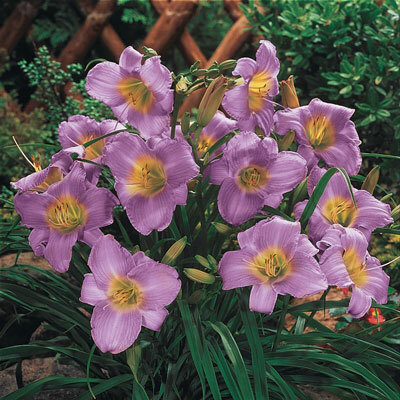 Purple de Oro Dwarf Daylily | Henry Field's Seed & Nursery Co.
Trumpet-shaped, 2-3 in. blooms are purple with bright yellow-green throats. Hardy and easy to grow with very little care. These dwarfed plants grow 15-20 in. tall. Full sun or partial shade. Pollinators love it. Bareroot. Zones 3-9. Color: Dark lavender with golden yellow-green throat. Foliage: Strap-like, medium to dark green foliage. Blooms: May - August sporadically (May not bloom until the second season). Flower Form: Trumpet-shaped flowers with ruffled, slightly recurved petals. Growth Rate: Slow while establishing, fast thereafter. Pruning: After flowering, remove spent flower stem low to the base to encourage repeat blooms.